So I molted last night last a freakish butterfly. My face seems to have calmed down to a blotchy red. It took me a long while to fall asleep though. My wonderful melatonin failed me. After reading Juliana’s research on sleep and how lack of sleep increases inflammation, I got up and took two benadrlys to knock me out. I woke up at 11am. I don’t recognize myself. I’m taking photos but I’m not brave like other bloggers to post them. So I take pictures of Ukee in place of myself. This above is a photo of Ukee and my latest discovery, a natural air purifier. 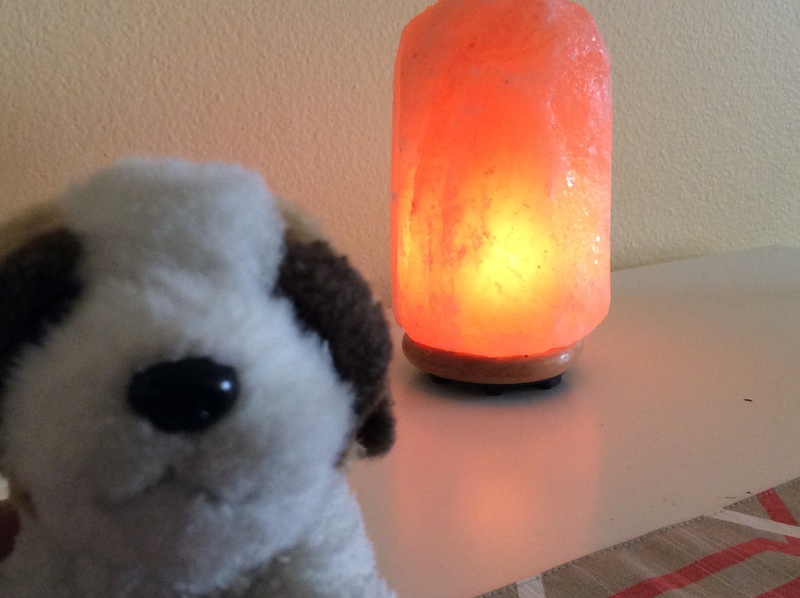 What does a rock lamp of solid salt have to do with TSW? Well stopping steroid meds makes me a bit concerned about asthma and breathing issues. I don’ t want to inhale steroids to breathe when steroids are having a not so great effect on me. I discovered that Himalayan salt is the non steroid inhaler that is getting great reviews. Since breathing problems seem weirdly not an issue, I opted for the air purifier instead of the salt inhaler. Consider checking out Himalayan salt inhalers if you think your breathing issues are more prominent in you during TSW than my experience. A month having quit topical steroids, I’ve not breathed easier. No difficulty whatsoever not even the asthma “cough” that used to bother me. Pretty air purifier lamp it is! As for controlling the pain, still working on that. I hurt. ~ by jnetsworld on July 6, 2015.